How Does the Cabbage Family of Vegetables Affect Arthritis? The U.S. Department of Agriculture predicts that each American man, woman and child will eat 8 1/2 lbs. of broccoli in 2011. The vegetable made its American debut in 1923, when two Italian brothers planted the first crop near San Jose, California. While Italian broccoli makes up the vast majority of the vegetable's consumption, it is not the only type of broccoli you can buy. The majority of broccoli sold in grocery stores and farmer's markets is the result of that first crop planted in California. Broccoli was largely a European crop grown on the coast of the Mediterranean Sea. Italian, or sprouting, broccoli introduced to America in 1923 grew from seeds imported from Messina, Italy. This variation is distinguished by its flowering florets that sprout from the center stem. Heading broccoli gets its name from its appearance. Heading broccoli resembles cauliflower, in that it forms a large central head without the sprouting florets. This is the most common form of broccoli grown in home gardens. Whether heading broccoli is a form of the vegetable at all is a matter of debate. While most consider it a style of broccoli, the College of Agricultural Sciences at Penn State University considers it a late-season cauliflower. Broccoli rabe is another debated form of the vegetable. 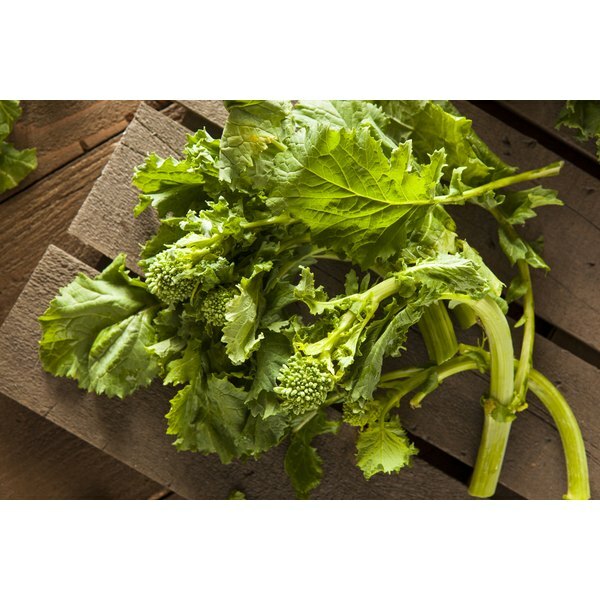 Penn State and Mother Earth News include broccoli rabe, or rapini, in its list of broccoli forms, while others argue that it is a wild herb related to turnips. It adopts the broccoli name as it sprouts small flowers similar in appearance to broccoli. Romanesco broccoli takes the shape of cauliflower, but is classified as a broccoli. Mother Earth News describes it as large upright plant requiring high temperatures and plenty of space to grow. It is a specialty vegetable, found in upscale restaurants and some grocery stores. U.S. Department of Agriculture Economic Research Service; Vegetables and Melons Outlook; April 28, 2011. U.S. Department of Agriculture Economic Research Service; Broccoli: Super Food for All Seasons; April 1999. Penn State University; Agricultural Alternatives-Broccoli; 2000. Is Ginger Fruit or Vegetable? Which Vitamins are in Brinjal?